Allan Armstrong (RCN and RIC activist) provides the following initial assessment of the proposed Scottish Left Project. This is the final part of three articles, the first of which examines the role of the UK state and SNP in attempting to derail Scotland’s ‘democratic revolution’ (see http://republicancommunist.org/blog/2015/02/24/british-unionists-and-scottish-nationalists-attempt-to-derail-scotlands-democratic-revolution/) and the second which looks at the inadequate response of the Left across these islands (see http://republicancommunist.org/blog/2015/03/16/the-left-in-the-uk-the-2015-general-election-campaign-and-the-wider-impact-of-scotlands-democratic-revolution/). 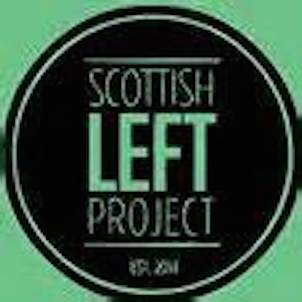 The Scottish Left Project (SLP) has been mooted in the context of the impact of Scotland’s ‘democratic revolution’, and the success of RIC as a movement within this. 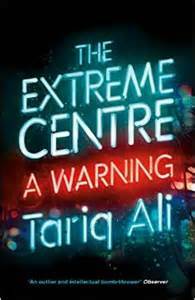 There is now a concerted effort by the unionist and nationalist parties to roll back this ‘democratic revolution’ . Therefore, the success of the SLP will depend upon whether it takes up the baton bequeathed by these momentous events, or lets itself become a bit-player in others’ political projects. As with RIC, the ISG has been the SLP’s prime mover. It is therefore useful to examine the way the ISG operated within RIC, to come to some better understanding of how it could see its role in the SLP. After analysing the role of the constitutional nationalists of the SNP, the liberal and conservative unionists amongst the Conservatives, Labour and Lib-Dems and the reactionary unionists led by UKIP, and their attempt to roll back Scotland’s ‘Democratic Revolution’ (http://republicancommunist.org/blog/2015/02/24/british-unionists-and-scottish-nationalists-attempt-to-derail-scotlands-democratic-revolution/), Allan Armstrong (RCN) examines the problematic role of the Left in the UK in challenging this. The continuing political impact of Scotland’s ‘democratic revolution’  can be seen in the run-up to the May Westminster General Election. The Conservative Party has produced a Westminster General Election poster, which highlights the importance they give to the issue of the future of the UK. 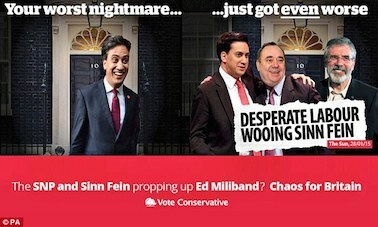 It conjures up a diabolic alliance between Ed Miliband, Alex Salmond and Gerry Adams (the latter two apparently pulling the strings behind-the-scenes, since Salmond now holds no post within the SNP leadership, and Adams sits in the Irish Dail ). 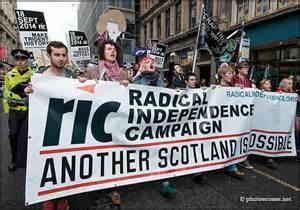 The RCN, which participated in the setting up of the Radical Independence Campaign in June 2012, has been discussing the possible futures for RIC after September 18th. Bob Goupillot and Allan Armstrong have further developed the idea of Movement and Party, first outlined in the RCN’s special bulletin for the September 25th RIC National Forum. As members of RIC we are trying to deal with the aftermath of a great battle in which we lost our main objective, Scottish self determination, but gained a great deal. We are licking our wounds, healing, reflecting and planning for the struggles of the future. This document is offered as a comradely contribution to that process.